Welcome to the 16th edition of the Pyro News. In this day and age most people now have the capability to view video footage on their computers. 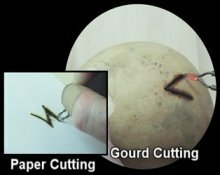 Because of this I've been thinking quite a bit about the possibility of using short video clips as a platform to visually demonstrate pyrographic techniques. In the future I want to produce demonstration snippets of techniques that are either very specialized or are too short to put on one of my DVD lesson discs. 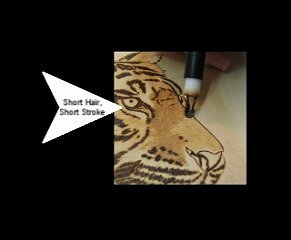 I'd also like to explore the possibility of using video to answering specific pyrographic questions...but let's take one step at a time. First I need to see if all of this is technically possible and if there is an audience for this kind of thing. Some of you will have slow upload speeds or would like to print off this information. Because of this I'm also including stills and captions of the lessons in this newsletter. Hopefully the clips are well received...if they are, more to come! It'd be great to be able to get my information across in a medium that can convey a lot more information than the written word. 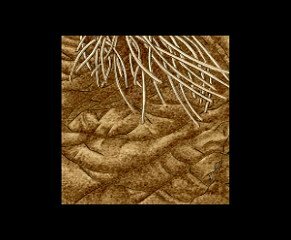 It's come to my attention that at least one woodburning instructor out there is advocating the use of MDF as a material to burn on. I can't stress enough how much I disagree with this practice. Apparently this person, (no names, no pack drill) states in their defense that they haven't felt any harmful effects so far. (I'm sure there are quite a few past cigarette smokers out there that have said the same.) Even though a few people might end up angry at me, I must say I find this attitude to be quite irresponsible. Teachers have a responsibility to pass on good safety procedures, not to pass on safety hazards. Formaldehyde sources in the home include pressed-wood products, cigarette smoke, and fuel-burning appliances. One last word on this before I get off my soap box; if you still want to burn on MDF, after hearing all the pros and cons, then that's your business...but please don't advocate it's use to other people. Will The Real 'Sue Walters' Please Stand Up? 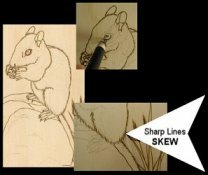 Just for your edification, I have written 2 published books: The Pyrography Workbook, a Complete Guide To Pyrography and The Wildlife Pattern Book. For play on television and computers. 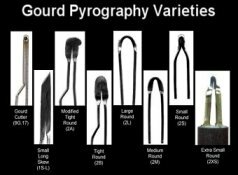 This DVD will be especially useful to those people who use wire nib burners, specifically those of North American design. The nib range of these machines can be extensive, making choice difficult. This DVD will also be very helpful in showing which existing tips in your kit to use when burning a project. Lastly, it will aid in concise nib choice when making future purchases, saving you from buying unnecessary products. 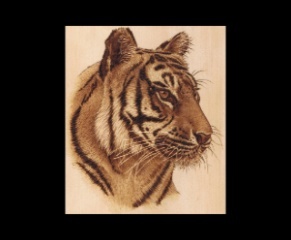 Some people think pyrography can't be erased... some people use sandpaper. 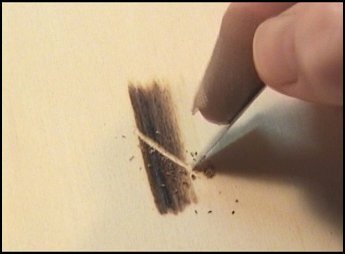 In this video I'll explain why I advise against using sandpaper while showing how I use a blade to successfully erase woodburning mistakes on wood. 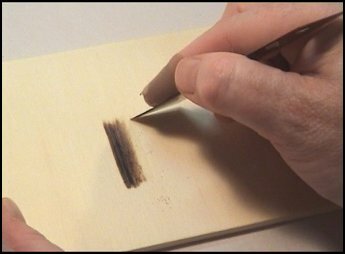 I find using sandpaper to erase pyrography mistakes tends to pick up the loose carbon and grinds it back into the surface. This tends to smudge and dirty the wood. 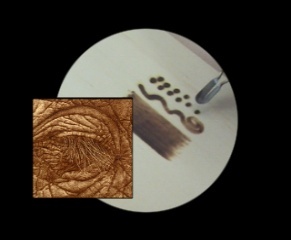 From the DVD Pyrography Nibs & Their Use. Click here to see purchase details. 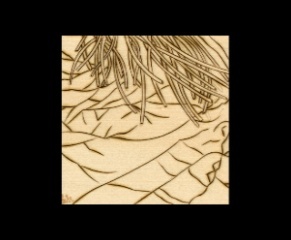 For clean and precise erasing of pyrography, I prefer the edge of a sharp blade. The key to erasing with a blade is patience. You must scrape lightly to gradually remove the burnt layers. Heavy & over zealous scraping can create ruts in the wood's surface. The resulting cleaned surface will be perfectly smooth & ready to re-burn should you wish to. 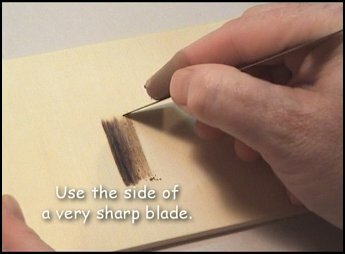 You can use the tip of the blade to erase or highlight small areas. 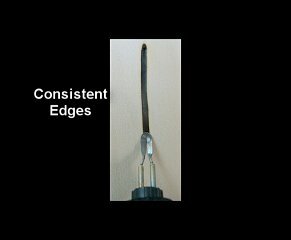 I prefer to use a simple snap blade for erasing but feel free to experiment to see what style of blade suits you. It's no secret that I'm a fan of the spoon shader. The only problem is, when asked, it's difficult for me to articulate in writing why I do. Hopefully this clip will show you in action what words alone can't explain. This clip is also a part of my new DVD, Pyrography Nibs & Their Use. From the DVD Pyrography Workshop: Study of a Hawk. Click here to see purchase details. 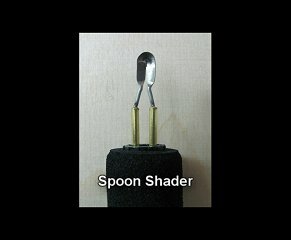 The spoon shader is round along its edge. Its profile has a shallow bowl shape. When a flat shader is tilted on contact with the surface one side of the line tends to burn darker than the other. Because the spoon shader has a slight convex shape, no one side can dig in. It burns a consistently even line. When compared side by side you can see that the flat shader does have one distinct advantage, it burns a broader area. Both shaders have a their own strengths, making a case for having one of each in your kit. Like other shaders the spoon shader covers larger areas by the application of a series of lines...one burnt line, next to and slightly overlapping the last. 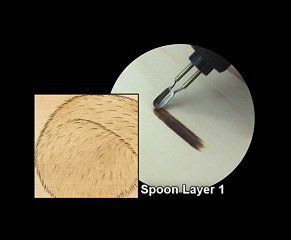 Because the spoon shader burns a soft wide line, I use it to burn the undercoat of animal hair. In the video I discuss this method while you view a series in inserted photographs. In the background I continue to demonstrate burning with a spoon shader. I build several layers of undercoat with the spoon, gradually darkening the coat where needed. 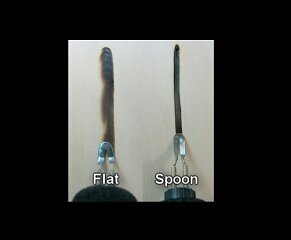 The strokes of the spoon are burnt in the same direction as the fur on the animal. 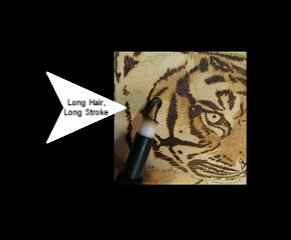 The length of the strokes are in proportion to the hair of the animal. They are also burnt slight staggered and askew to each other...to prevent burning a series of tram tracks. After the undercoat tone is burnt with the spoon shader, a writer is used to add more defined hair on top. 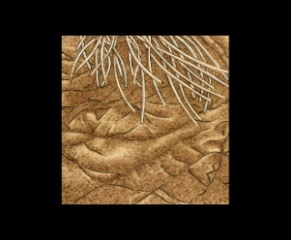 Next, a final layer of dark, fine hair is added with a skew tip. ...long strokes on the tiger's rough. The complete tiger. 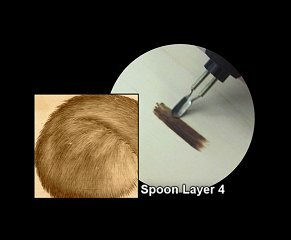 The spoon shader burnt all of the tonal undercoat and gave the initial structure and texture to the fur. 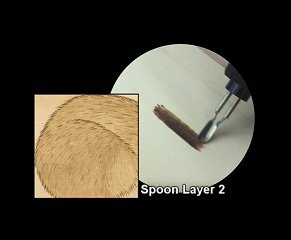 One advantage of the spoon shader is it can be swept in any direction...making it possible to use when writing or when drawing entire pictures. 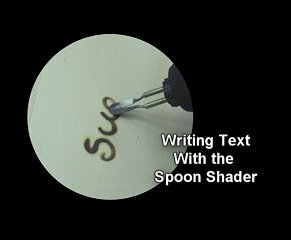 The spoon shader is also great for burning broad stipples. Stipples can be used purely for decoration or can be used to burn entire pictures. 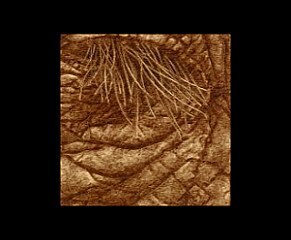 The skin texture of 'Elephant Eye' was burnt entirely with a spoon shader. Layer 1 was burnt lightly. Layer 2. Additional blobs were peppered across the surface. Layer 3. Gradually the darker tones are added to. Once an area reaches the darkness I want, I no longer add any more blobs to those areas. ...until a 3D effect is achieved. 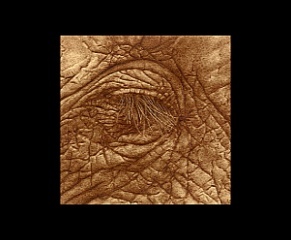 This is a close up of the elephant eye after completion. Even though this technique is slow in building, it is very difficult to make mistakes and the 3D effects can be very realistic.